Every year Pantone comes out with a color of the year, and this year they have declared it to be emerald, which I love, because who doesn’t love an emerald? As you know, there are times when my juices get going when a fabulous piece of estate jewelry comes across my desk, and I get that way when I see a gorgeous emerald. Over at the Jonathan’s Fine Jeweler’s blog, we published a Gemstone Gift Giving Guide, which I encourage you to all go and print out, but let’s just talk about the emerald. The emerald is the birthstone for May, the Zodiac stone for Virgo and the traditional wedding anniversary stone for the 20th and the 55th anniversaries. The emerald is a pretty powerful stone and has many symbolic meanings. 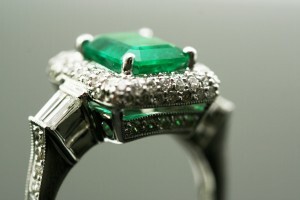 It is said that the emerald offers physical, emotional and spiritual balance. In relationships, it is supposed to bring security in love and promote domestic bliss. It inspires calmness and clear thinking and has spiritual healing properties and has even been related to abundance and creativity. The emerald is one of the harder stones and is from the Beryl family. The color green is due to traces of chromium and vanadium that are found in the earth’s crust that mixes with the beryllium. The beauty of the emerald can vary depending on how concentrated those elements are when they are mixed deep within the earth, and different parts of the world produce different qualities of emeralds. Fine emeralds are as valuable as diamonds because it is rare to find a large emerald with good deep color and good transparency. It is also important to note that emeralds usually have inclusions and they are not considered to detract from their beauty or even their value in some cases. Just a few pieces of some of my favorite emerald jewelry that I have had the pleasure to see and buy over the years, of course, if you see something you like, contact me!